India Cricket vs. Pakistan Cricket: How's that? Cricket is undoubtedly the most popular sport in India as well as in Pakistan. It was introduced in India before partition by British. It has been played in these nations since the 1800’s. Both countries have given birth to some extraordinary cricketers. Today both teams hold ranks among the top ten cricket teams in the world. Both India and Pakistan have field hockey as their official national sport, but cricket continues to be the most popular sport among the people of Indian subcontinent. There is no fixed pattern in which Indian teams tour or play at home. It has been noticed most recently that Indian teams have a tendency towards playing one day internationals rather than test matches. Indian International Cricket is under the control of BCCI which happens to be the richest cricket board in the world. Pakistan’s cricket is controlled by the Pakistan Cricket Board. It is an official member of the ICC and the Asian Cricket Council and hence participates in ACC’s officially sanctioned competitions including Asian Test Championship, Asia Cup, Asian Cricket Junior Tournaments and the ACC trophy. A large number of domestic tournaments are organised in India. These include BCCI Corporate Trophy, Irani Trophy, NKP Slave challenger Trophy, Ranji Trophy, Duleep Trophy, Vijay Hazare Trophy, Deodar Trophy, Interstate T20 Championship, Indian Premier League (IPL) and the Syed Mushtaq Ali Trophy. The last three tournaments were dedicated to the twenty-twenty game format. The Royal Bank of Scotland is the main sponsor of domestic cricket in Pakistan. Major domestic tournaments in Pakistan are the Quaid-i-azam Trophy, Patrons Trophy and the Twenty-20 Cup. Domestic cricket proves to be a great platform for youngsters to come forward and display their talent. Regional teams in the IPL have given opportunities to many players who could not have come forward due to lack of resources. The Indian team surprised everyone by winning a test series in England for the first time in 1971. In 1983, the Indian Team led by Kapil Dev, brought the Cricket World Cup to their country. 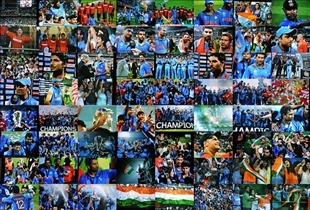 India won the first ICC World T20 held in 2007. Pakistan, on the other hand, won 1992 World cup and 2009 ICC World T20. It was introduced in India by British. There is no fixed pattern in which Indian team tours or plays at home. India won 1983 world cup and 2007 T-20 World Cup. Indian International Cricket is under the control of BCCI which is the richest cricket board in the world. A large number of domestic tournaments such as Ranji Trophy, Duleep Trophy, Vijay Hazare Trophy, and IPL are organised in India. Pakistan’s cricket is controlled by the Pakistan Cricket Board. It is an official member of the ICC and the Asian Cricket Council. Royal Bank of Scotland is the main sponsor of domestic cricket in Pakistan. Major domestic tournaments in Pakistan are Quaid-i-azam Trophy, Patrons Trophy and the Twenty-20 Cup. Pakistan won 1992 World cup and 2009 ICC World T20. Which cricket is more involved in match fixing? Sachin Tendulkar vs. Sir Donald Bradman: Who is best? LeBron James vs. Kobe Bryant: Who is the king of Basketball?